Home Guest Posts SEND, support staff and challenging behaviour in schools. You may remember that we had Tess Philbert on the site not so long ago, talking about person-centred planning. Tess is a parental supporter for SENDIASS (Special Educational Needs and Disability Information Advice and Support Service) which used to be known as Parent Partnership. Today it's lovely to have Tess back with her huge enthusiasm for improving the lives of families struggling with an often impersonal and inflexible SEND system. She has lots of knowledge to share, having spent a decade working in a special school for until she obtained her degree in SEN and inclusive education. Tess is writing today about her own research into Learning Support Assistants, challenging behaviour and how it's tackled in schools. Hi everyone, I hope all is well with you all! I am really glad to be back in the jungle, now how often do you get to say that? O.K, before I go completely off course, I should tell you why I’m back. Being a part of a few social media SEN parent groups, I have noticed a few recurring areas of discussion. One of those is the use of challenging behaviour in special schools. Yep…I know it’s a big one! It’s definitely an area of SEN that doesn’t receive much coverage in policy. So, that’s encouraged me to share with you some of my experience and research into this matter. Whatever your perspective, whether it be professional, parent/carer, young person I hope this blog will be of some use. I conducted a small qualitative research study, if you’re not sure what that means, it’s a fancy way of saying I spoke to and engaged with people, as opposed to gathering information from facts and figures. The study took place at a special school in Essex, and it utilised the experiences of a group of Learning Support Assistants (LSAs), with different levels of experience, to explore some of the difficulties they encounter with implementing behavioural interventions. Furthermore, in conducting the research and writing this blog, I have drawn on my 10 years of experience as a LSA in a special school for learners with complex needs. That experience has provided me with a unique insight into applying behaviour intervention techniques. Extensive discussions with other support staff, lead professionals and training providers has helped to shape understanding. 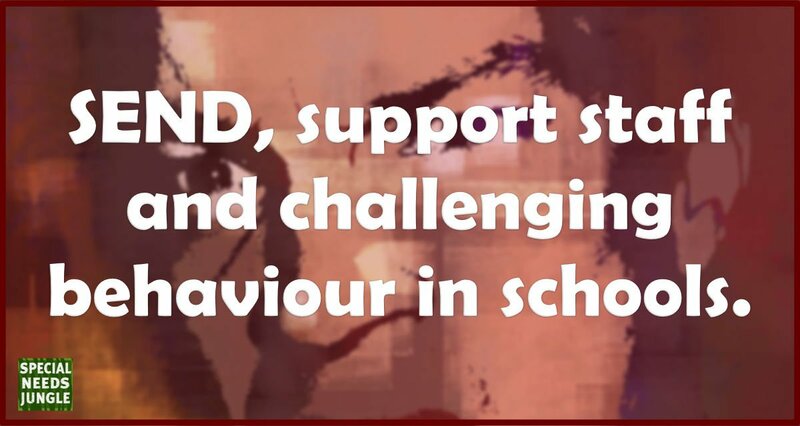 LSAs in special education schools have an integral role in the practical implementation of behaviour interventions plans, in order to support the individual needs of learners with intellectual disabilities and challenging behaviour. In classrooms that have 1:1 staff/pupil ratio, it is part of the LSA role to implement classroom behaviour interventions. These interventions range from everyday classroom strategy to positive handling techniques. Despite the range of professional and personal skills necessary to fulfil this role, there has been very little research undertaken looking at the challenges support staff in special schools face with physical interventions and the impact of the young people involved. My own experience in a special school, supporting learners with challenging behaviour, had already ignited a need to know more about this aspect of SEND provision. The findings of my research demonstrated to me that the training needs of staff should be developed in diverse learning contexts. For example, less experienced LSAs can better understand the causes of certain behaviours if they're given behavioural and emotional knowledge training. Not understanding why challenging behaviour happens can cause some staff to feel like it’s a personal attack and, consciously or sub-consciously, reduce feelings of empathy for the learner. Furthermore, not having the appropriate self-regulating skills or supervision to process those feelings can be very challenging in itself and contribute to loss of confidence when implementing interventions. So it just makes sense to bring some focus to providing LSAs with the relevant levels of training to effectively support learners…doesn’t it? LSAs need more training in behavioural knowledge, to counteract some of the positive handling techniques that are inappropriate for some learners. It could also reduce some of the challenges of implementing physical interventions. Staff training in methods of physical intervention is widely undertaken in special school environments. Organisations such as Team Teach, train staff in a range of ‘positive handling and restraint methods’. Positive handling is the guiding principle that helps to ensure interventions are in the best interest of the student, minimum force is applied and techniques should not cause pain. However, I think Team Teach can have the opposite effect on those being restrained, and it’s not just me saying that …I promise! Studies have revealed that although staff in community care settings had been trained to implement positive handling techniques, some of the residents had routinely reported pain and discomfort as a result of positive handling intervention. Within the same research, the post-intervention experiences of staff were also accounted, revealing that some of the residents' experiences of a physical intervention were worse than staff had perceived. So we can see that there was an inconsistency between the residents’ experience of physical interventions and staff perceptions of their experience. These types of inconsistencies might be bridged by exposing staff to training that would enhance their interpersonal skills and feelings of empathy. Studies show that 10-15 percent of individuals with intellectual disabilities who are in education, demonstrate challenging behaviour. Environmental factors, coupled with the settings' ability to influence behaviours, can be significant considerations when deciding whether or not certain behaviour is challenging. Elsewhere, research suggests these behaviours can also be socially constructed. Acknowledging challenging behaviour as a form of communication is essential, in order to deliver effective support to these learners. Applied behavioural analysis theory (ABA) considers challenging behaviour to be a form of communication, influenced by a combination of internal (biological/physiological) and environmental factors. To build understanding on how these factors impact individual learners, training must be accessible to all staff, particularly those who have the immediate responsibility of supporting learners with intellectual disabilities and challenging behaviour. Organisational culture and strong school leadership appear to help embed the practical and emotional skills needed to implement communication interventions effectively. Interventions selected for staff training should take a person-centred approach to supporting learners. This means that wherever possible, a social model [of disability*] approach should be adopted. This is preferred over the medical model, which can hinder staff understanding of learners’ capabilities and possibly create a barrier to the learner’s social participation and engagement. * The social model of disability is based on a distinction between the terms "impairment" and "disability." Impairment is used to refer to the actual attributes (or lack of attributes), the abnormality, of a person, whether in terms of limbs, organs or mechanisms, including psychological. Disability is used to refer to the restrictions caused by society when it does not give equivalent attention and accommodation to the needs of individuals with impairments. Ultimately, LSAs should be trained in a broad range of interventions that supports person-centred, individual need and capability. Supporting staff in this manner supports the understanding that disability should not be grouped according to a single need. Prominent research suggests that improving the quality of life for learners with SEND and challenging behaviour and the staff who support them is of equal importance. Developing an understanding of challenging behaviour from the staff’s perspective should be a core strategy, so they can be supported while caring doing their jobs. For the most part, UK Government literature adopts a somewhat crude approach to behaviour intervention training, giving little attention to the needs of different schools, changes in the educational environment or the diverse role of support staff. No specific guidance is provided on training available to LSAs working in special schools. The research I conducted, adopted a more granular approach, considering the specific training needs of these LSAs and how this might differ from support staff in mainstream schools elsewhere. Yes, I know… cuts, cuts, cuts…there’s just no money! My hope is that the more this issue is spoken of and brought to the attention of the purse holders, the more support can be given to LSAs in this area of SEND. Well, Martin Luther King had a dream and so do I! However, my small research study has demonstrated that training support staff to understand why challenging behaviour happens and also learning how to unpick their own emotional responses to it, is essential. This is where I leave you and say goodbye for now…until my next venture in the Jungle! This is a topic that is close to my heart and so I hope it resonates with yours, extends existing knowledge and supports understanding. Thanks Tess, this is spot on! Team Teach appears to promote very little in the way of functional behaviour analysis – and behaviour management can only be effective once practitioners understand WHY the behaviour occurs. I could talk for hours about my son’s experiences and the detriment to his mental health, but suffice to say I’ve seen the damage that can be caused by a Head Teacher’s rigid adherence to TT as ‘what we use in this school’ (in the face of clear evidence it was making matters worse for both pupil and staff). A big part of the problem – for autistic pupils in particular – is that it’s simpler and cheaper to implement reactive behaviour management than it is to assess and plan around sometimes very complex social, emotional, communication, and sensory needs. We all know the legal framework, but it can take years to get things right when finding supporting professionals with relevant expertise is a task in itself. Until then pupils and the staff working with them must muddle through, with mixed results. It’s a fine balance between a sympathetic approach and underplaying the impact behaviour can have on everyone involved, but if we are to encourage better understanding and training, and better responses, we should also address the language used. My preference is ‘behaviours of concern’, because ‘challenging behaviour’ implies behaviour that’s a challenge for practitioners to manage. Remember, we’re talking about a child who is so upset that normal routes of communication are temporarily beyond them: Is it right to describe their behaviour in terms of the inconvenience it presents to others? I say not, but I’d be interested to hear other views. I totally agree with this article, however, I feel this should also apply to mainstream schools where these children are put first until a formal diagnosis is given and the now EHCP plan is put in place…this can be a minimum of 2 years! Meanwhile mainstream staff are dealing with challenging behaviour with little to no training outside of the old standby of team teach, to the detriment to all involved but especially the child.